Sensationalist predictions about oil prices have become all the rage over the past two months, with an analyst at Goldman Sachs (NYSE: GS) recently highlighting the potential for West Texas Intermediate (WTI) to collapse to $20 per barrel. Not surprisingly, prognostications in the newsletter business have been even more extreme; readers have asked us about the validity of some pundits’ calls for crude oil to sink as low as $10 per barrel. The motivation for these forecasts: Sensationalist calls garner media attention and attract a lot of eyeballs, regardless of whether these predictions pan out. Many pundits have updated their outlook for oil prices at each floor on the way down, letting the market do the work for them. Unlike these professional elevator attendants, we’ve maintained the same forecast for almost a year: That WTI would tumble to at least $30 per barrel this fall or in early 2016, before settling into a range of $40 to $60 per barrel for an extended period. Our call for WTI to tumble to $30 per barrel in the coming months hinges primarily on seasonal trends in the oil market. US oil demand peaks during the summer, when consumers take to the roads in droves and gasoline consumption increases. The winter also brings a slight uptick in demand, as colder temperatures drive consumption of heating oil. Between these two periods of elevated demand, US oil consumption experiences a bout of seasonal weakness, during which refiners take some of their capacity offline for maintenance and upgrades. This seasonality historically has increased inventory levels in October and November and resulted in an even larger build in oil stockpiles from February to April. 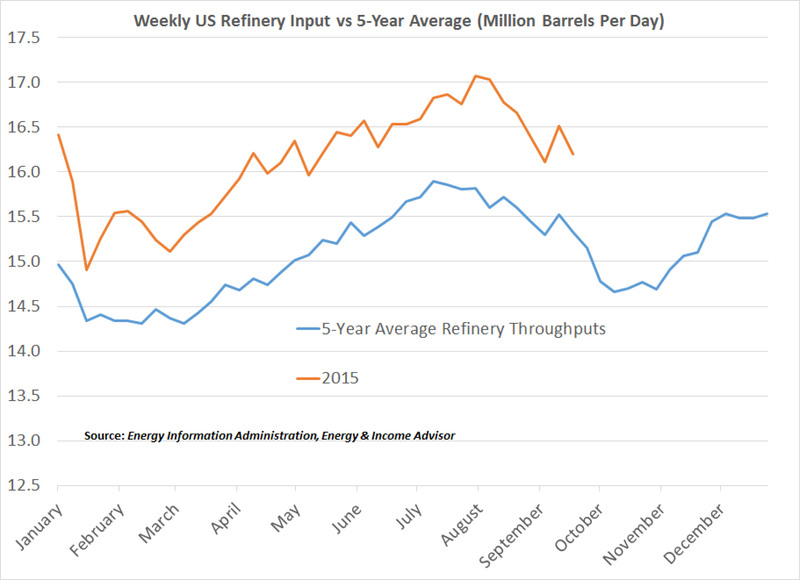 US refinery runs of crude oil have topped their five-year seasonal average by about 7 percent thus far in 2015. At the height of the summer driving season in July and August, these inputs exceeded the 2010-14 average by almost 1.1 million barrels per day. Although the US refinery complex ran all-out to keep pace with demand, oil inventories in April 2015 still climbed to a high of more than 490 million barrels. 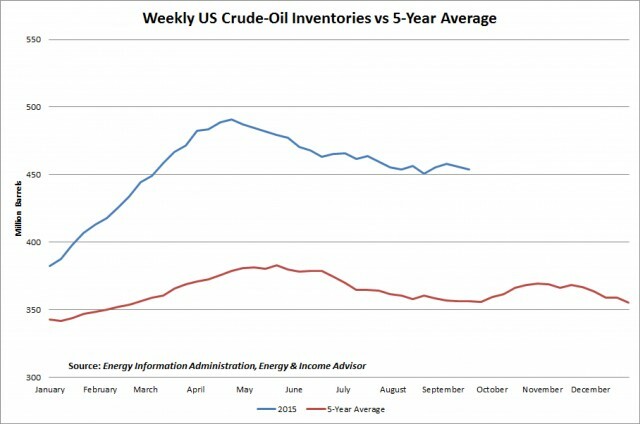 Since summer driving season started in June 2015, US oil inventories have ranged from 90 million to 105 million barrels above their five-year average. Already elevated oil stockpiles, coupled with seasonally weak demand from October to November and February through April, set the stage for a sharp selloff in the price of WTI. 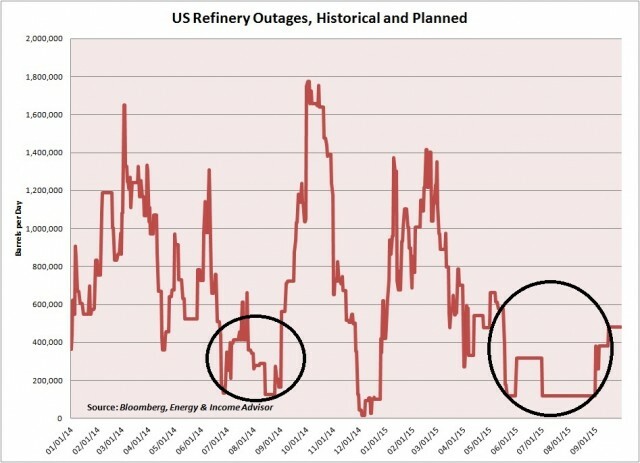 And this year’s turnaround season could involve more capacity outages than usual because refiners ran their facilities flat-out this summer to take advantage of sky-high profit margins. The first of these seasonal lulls has already started. US refineries last week reduced their crude-oil runs by 310,000 barrels per day sequentially and 872,000 barrels per day from the peak in late July. This downtrend will continue over the next few weeks, with refinery inputs reaching their fall nadir in October. 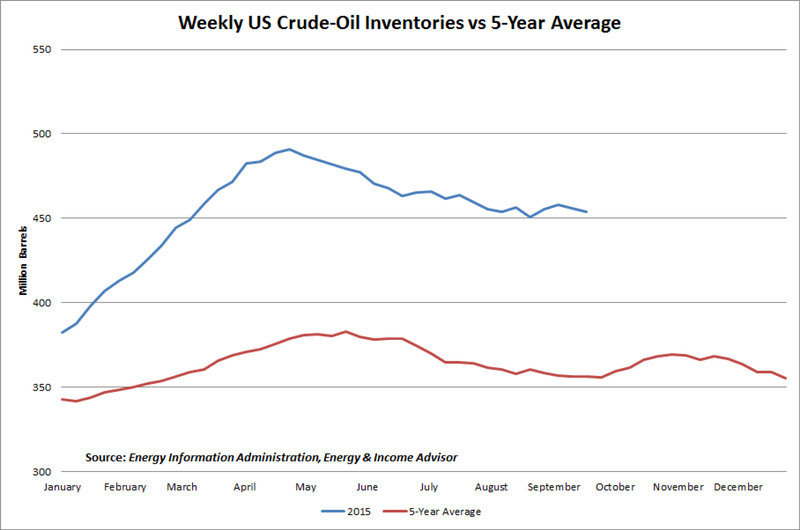 And as refiners’ demand for crude oil weakens, inventories will start to expand from already-glutted levels. An increase in heating oil demand should halt the inventory build for a few weeks in December, but stockpiles should start to swell again in January and build for the next few months. The plunge in the US oil-directed rig count has started to show up in the Energy Information Administration’s weekly production estimates, which have declined to about 9.14 million barrels per day from a peak of more than 9.6 million barrels per day. 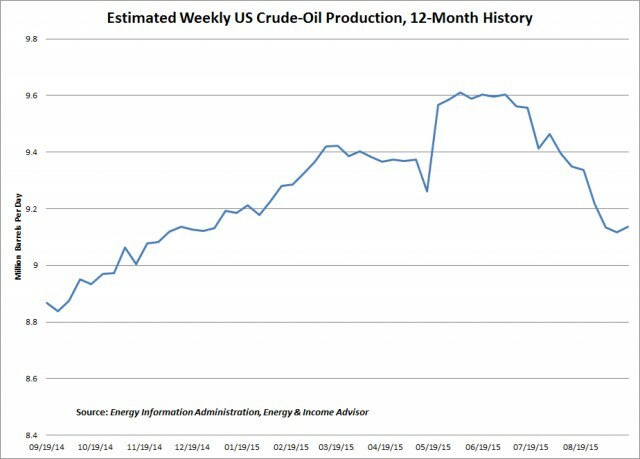 Non-OPEC production outside the US has trended lower in recent years, but has declined at a slower rate. Meanwhile, OPEC like will maintain production near record levels in late 2015 and through at least the first half of 2016. Bottom Line: Oil production won’t decline quickly enough to offset elevated inventory levels and seasonally weak demand, setting the stage for further downside in WTI prices. 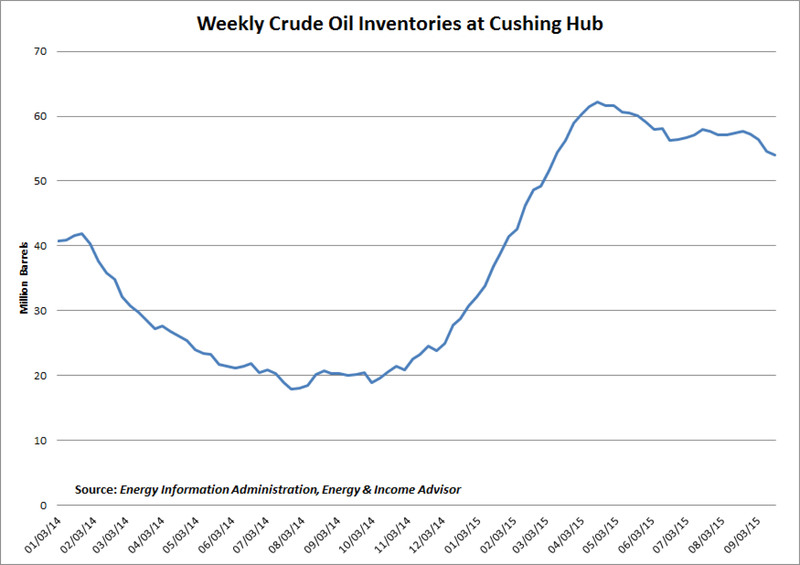 We’ll keep a close eye on inventories in Cushing, Oklahoma, the delivery point for the WTI futures that trade on the New York Mercantile Exchange. Crude oil stored at Cushing reached an all-time high of 62.2 million barrels in mid-April 2015 and has declined to about 54 million barrels over the intervening months. But with the summer driving season over and refiners reducing their utilization rates, Cushing inventories could challenge existing capacity limits by spring 2016. In an extreme case, these stockpiles could reach capacity, requiring producers to shut in some wells—this scenario would produce the necessary shock to send WTI to less than $30 per barrel. After next spring, the risks of this scenario will fade quickly. Rising demand for crude oil next summer would help to alleviate the excess inventory, while the decline in US and non-OPEC oil output will also help to return the market to a healthier balance. Although the calls for oil prices to hit $20 or fall even lower get a lot of play on financial infotainment channels, these bold forecasts hold little relevance for most investors. The most important aspect of our outlook calls for WTI to trade between $40 and $60 per barrel over at least the next 12 to 24 months. Even if oil prices crater next spring, this move would be relatively short-lived; a week or two of extremely low oil prices wouldn’t exert an outsized impact on full-year profits. For equity investors, the calendar strip—the average price of oil future contracts expiring over the next 12 months—provides better insight into the implications of commodity prices for energy companies. Since the downturn began, the 12-months strip has usually traded at a higher price than the front-month futures price cited on financial websites and in the media. At times, the price spread between these benchmarks has widened significantly. For example, WTI prices plummeted in March 2015 because oil inventories increased during a period of seasonally weak demand. This short-term headwind drove front-moth future prices lower, but longer-dated contracts held up reasonably well. This phenomenon helps to explain why oil prices sank to new 52-week lows in early March, but the S&P 500 Index held up reasonably well; equity investors anticipated a seasonal uptick in oil prices because of the seasonal increase in gasoline demand and continued to by energy stocks. More recently, the 12-month strip declined to less than $50 per barrel—exactly the shock needed to move the oil market toward a durable bottom over the next six to nine months. The inventory-driven plunge in spot and front-month oil prices later this year and/or in early 2016 will create an excellent buying opportunity for select energy stocks. Such a selloff undoubtedly will receive fuel from sensationalist headlines in the financial media. Our call for oil prices to remain lower for longer may seem bearish for the energy sector. However, energy stocks don’t need rising oil prices to outperform—stable oil prices will do. Energy stocks tend to outperform when oil prices climb and underperform when crude prices weaken. But they can also generate solid returns when oil prices fluctuate within a steady range. Consider 1989 to 1995, when oil traded at low prices and declined by 10.4 percent; over this period, the S&P 500 Energy Index rallied 76.7 percent. As in the late 1980s and early 1990s, energy companies with high-quality asset bases and strong balance sheets will be able to win market share from cash-strapped competitors and rivals with elevated production costs. These names will also be well positioned to grow production and expand their market share by participating in sector consolidation. For example, recent news stories report that Exxon Mobil Corp (NYSE: XOM) has started to meet with small producers in the Permian Basin about potential joint ventures or acquisitions that offer a cut of future proceeds instead of stock or a cash payment. Investors looking to profit from energy stocks will need to be patient. Far too many pundits and analysts advocated buying the dip in the energy sector in fall 2014 and the subsequent winter, based on the faulty assumption that oil prices would recover as quickly as they did after the 2008-09 financial crisis. To make money, investors need to follow the playbook from the past supply-led declines in oil prices, not the strategy that paid off in 2009. In the oil bear market of the ‘80s and ‘90s, successful investors made serious cash by buying high-quality energy stocks at bargain prices and reducing their exposure to this group when valuations became stretched. Stalk high-quality names and be patient for favorable entry points to emerge. Let the market’s volatility work in your favor. Roger Conrad and I have spent weeks assembling a shopping list of high-quality energy stocks to take advantage of the coming buy opportunity. We’ve also calculated Dream Buy Prices for this elite list of stocks, based on trough valuations during previous downturns and our outlook for oil and gas prices. These extreme valuations represent once-in-a-generation buying opportunities. The turmoil in oil prices and indiscriminate selling in the energy sector this fall and winter could create an epic buying opportunity for discriminating investors. However, the universe of energy stocks that meet our criteria is relatively small; don’t misconstrue this call as open season to buy energy stocks. Not every company has the potential to outperform, let alone survive.